Since 1975, writer, performer, director and activist Marty Pottenger has created multidisciplinary placemaking performances, plays, arts-based civic dialogues, and community arts projects throughout the United States. Her performance in City Water Tunnel #3 won an OBIE and her play ABUNDANCE, written from interviews with 30 millionaires and 30 minimum wage workers, was selected as one of The Seattle Post-Intelligencer’s ‘Ten best plays of 2003′. A longtime union trades activist, low-income housing organizer, Board Chair of the American Festival Project and member of Heresies magazine collective, she left New York City in 2007 at the invitation of the City of Portland, Maine to launch Art At Work, a national initiative to strengthen cities through strategic art projects with municipalities and communities. Working on staff at City Hall, Art At Work has launched 15 arts projects that tackled historic low police morale with poetry, racial discrimination in Public Services with block prints, escalating incidents between youth & police with performances. Recognitions include a Local Hero Award from the Portland Police Department for their Police Poetry/Photography Calendar; a National Leagues of Cities Best Practices nomination; and the selection of Art At Work’s Our Town project – Meeting Place – to be featured in one of the NEA’s five e-book’s on Creative Placemaking. Since the 1990’s, she has been a featured speaker on arts-based civic engagement, arts & social change, and evaluation practices in the United States and Europe. Arts projects that focus on engagement and collaboration outside the arts sector are sometimes the most successful, but are often the most difficult to complete successfully. A practitioner’s seasoned perspective on creating work that engages and transforms communities, we will learn about projects with New York City’s Department of Environmental Protection/Local 147 Sandhog’s Union, a city-wide gathering at Union Square four days after 9/11, and a national arts project with 30 minimum wage workers and 30 multi-millionaires. Presentation will also include Art At Work is a national initiative to improve municipal government and the communities they serve through strategic arts projects with municipal employees, elected officials, residents and artists. Creative Placemaking with people at the center, AAW strengthens community resilience and generates cultural, civic and economic vibrancy by engaging people in making and experiencing art that matters. In the face of increasingly complex municipal challenges and diminishing resources, Art At Work has successfully demonstrated that artmaking is a valuable, cost-effective, sustainable tool that builds respect, sense of purpose, collaborative capacity and vision within the municipal workforce and the communities they serve. Piloted in partnership with the City of Portland ME since 2007, Art At Work Holyoke was launched in partnership with the City of Holyoke MA in 2012. Art At Work has put creativity to work delivering measurable outcomes that have improved police morale, deepened cross-cultural understanding in Public Works department, ended escalating confrontations between youth and police and significantly increased the public’s awareness and appreciation for art, local government and civic engagement. 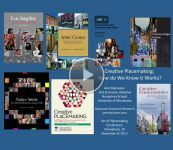 Our neighborhood development Our Town project – Meeting Place – was selected to be featured as one of the NEA’s five e-book’s on Creative Placemaking.